How Much Would the City’s Annual Contribution Be Today If Aid for the Metropolitan Transportation Authority’s Capital Projects Had Kept Pace with Inflation? The city makes an annual payment to the Metropolitan Transportation Authority (MTA) to support the authority’s capital program. NYPIRG’s Straphangers Campaign asked IBO to review the annual contributions to see if they have kept pace with inflation. • The city’s contribution to the MTA’s first five-year capital plan (1982-1986) averaged $136 million a year. In nominal terms, the city’s contribution was highest during the 1987-1991 and 1992-1999 plans and has remained fairly constant at around $100 million per year since 2000. 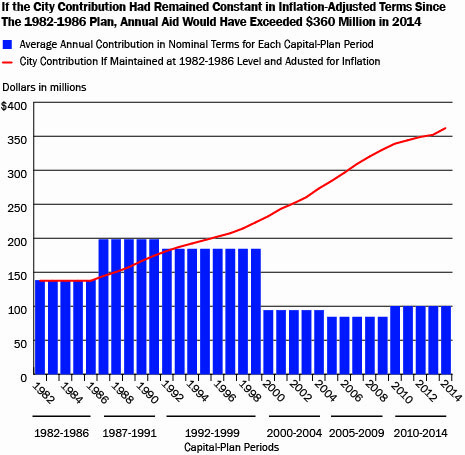 • If the city had instead decided to keep its contribution at the 1982-1986 level in real (inflation-adjusted) terms, the contribution would have reached $363 million in 2014, and provide more than $1.8 billion for the proposed 2015-2019 capital plan. • The city’s contribution to the MTA’s 1982-1986 capital plan averaged 1.2 percent of total city-funded expenses over the five-year period. Over time the city’s contribution as a share of total city-funded expenses has declined dramatically. The city’s contribution to the MTA capital plan in 2010-2014 averaged just 0.2 percent of total city-funded expenses a year. New York City and state also provide indirect support to the capital program through dedicated tax revenue—in most cases, revenues predominately collected in the 12-county MTA region—that flow into the MTA’s operating budget. These revenues, which have grown substantially over the past three decades, are used to pay debt service on MTA bonds that finance capital projects as well as the operating expenses of the transit system. IBO estimates that New York City residents alone generated around $3.1 billion in city and state tax revenue for the MTA in 2014, compared with just $235 million in 1983. NOTES: Inflation measured by the local government GDP deflator for the New York City metropolitan region. IBO compares the city’s contribution to the MTA on a calendar year basis to the city’s fiscal year expenditures.